As in all areas of the world, there is a need for effective management of East Africa's natural resources. However, the population is rapidly increasing, nearing 240 million in Tanzania, Kenya, Uganda, Rwanda, and Burundi alone. Meanwhile, more people are moving into urban areas. These two factors are creating an economic burden that hampers governmental efforts and strains economic resources. Moreover, East Africa's constant severe drought, famine, and disease thwart governments' efforts to provide relief to the people. As a result, East African governments cannot meet the basic needs of their citizenry. East African governments are, quite simply, overwhelmed by colossal problems and limited resources. 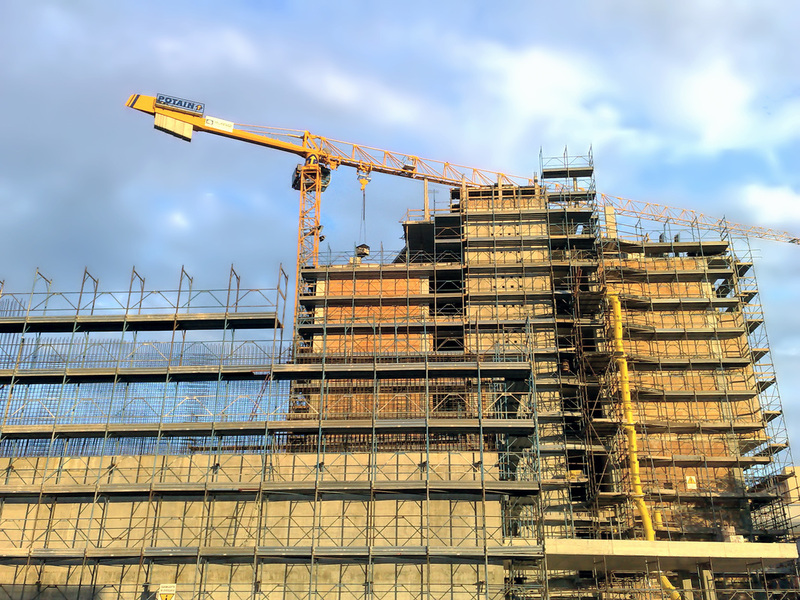 Given the magnitude of need in East Africa, and in light of East Africa’s severely limited economic resources, it is not surprising that governments give environmental reform low priority. In truth, East African governments are apathetic to environmental reform. Marine/coastal ecosystems support human well being and provide important economic services; therefore, destruction of these ecosystems puts the livelihoods of millions of coastal inhabitants in jeopardy. Even so, governments barely enforce even rudimentary environmental good practices. They allow wanton devastation of forests, swamps, and wetlands to continue entirely unchecked. Sadly, the coastal/marine environments are bearing the brunt of ongoing degradation and long-term consequences that will be difficult to reverse if left unchecked. Indeed, the continued well being of East Africa’s coasts and their peoples will depend on how well marine biodiversity and resources are conserved and managed. There is a clear, urgent need to bring about environmental awareness in East Africa. External assistance, in the form of funding environmental reform efforts and educating East African communities, is absolutely essential to preserve the area’s coastal/marine resources and implement sustainable resource management. 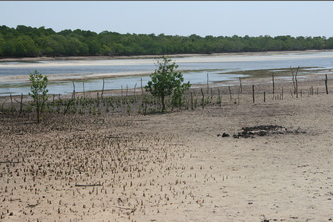 Healthy, protected mangrove forest, Lamu, Kenya. ﻿Mangrove forests provide sheltered areas needed by juvenile fish and other marine organisms as well as other wildlife and enhance biodiversity in neighboring habitats, such as coral reefs. Further, mangroves are important to many animals not exclusively associated with mangrove areas, including endangered species such as the dugong, several species of marine turtle, and different species of porpoise. 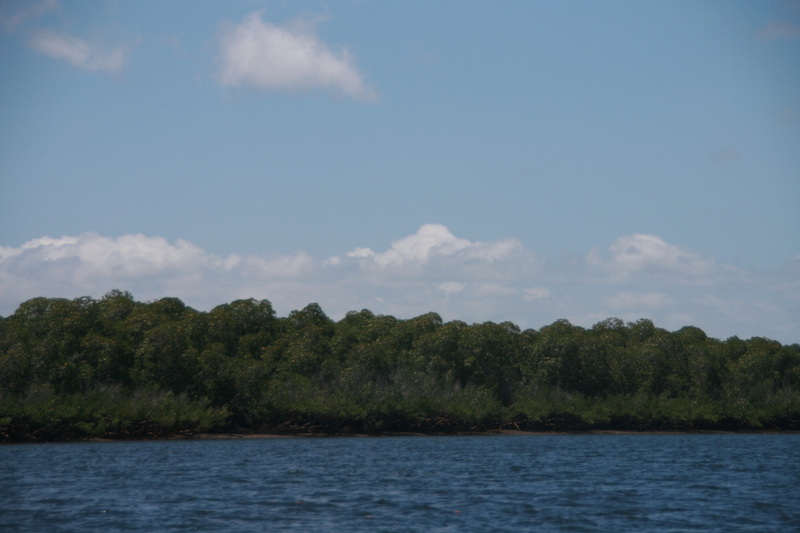 Mangroves also provide an important habitat for migratory birds, as well as terrestrial wildlife. In addition to supporting both terrestrial and marine species, mangroves protect river systems, stabilize shorelines, and help to filter and clean water. The destruction of these forests has resulted in a dramatic increase in coastal erosion and a significant decline in fisheries. Mangrove forests are naturally resilient, having withstood severe storms and changing tides for many millennia. Unfortunately, until recently, mangrove forests had been classified by many governments and industries as "wastelands" or useless swamps. This mistaken view has facilitated the exploitation of mangrove forests as cheap and unprotected sources of land and water. Today, less than half the world's original mangrove forest cover remains. This deforestation has resulted in a decline in fisheries, threats to migratory bird species as well as much wildlife, coastal erosion, and increased release of carbon dioxide into the atmosphere, making mangrove forests among the most threatened habitats in the world. In fact, they are disappearing more quickly than inland tropical rainforests and, so far, with little or no public notice. Indeed, mangrove deforestation threatens the sheer existence of many animal species--humans among them. 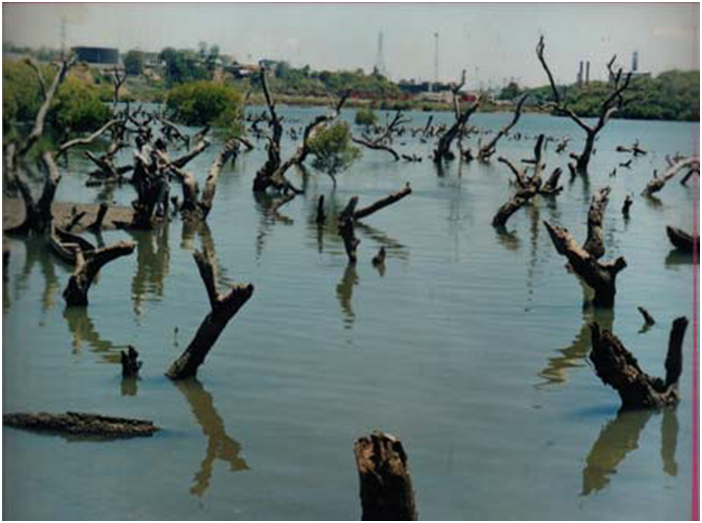 Urbanization in the area have caused excessive loss of land destroying mangrove forests. 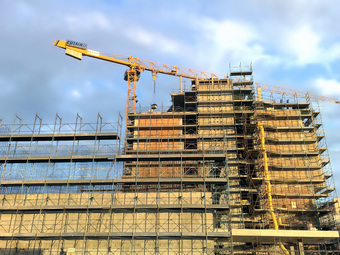 Urbanization/Development: causing loss of ecosystems and loss of wildlife. 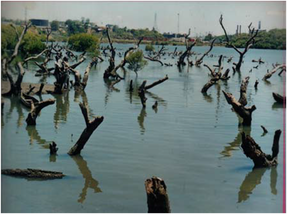 Lack of clear understanding and recognition of the importance of mangroves and the impact of urbanization, including construction of ports and roads, is contributing to extensive mangrove losses. 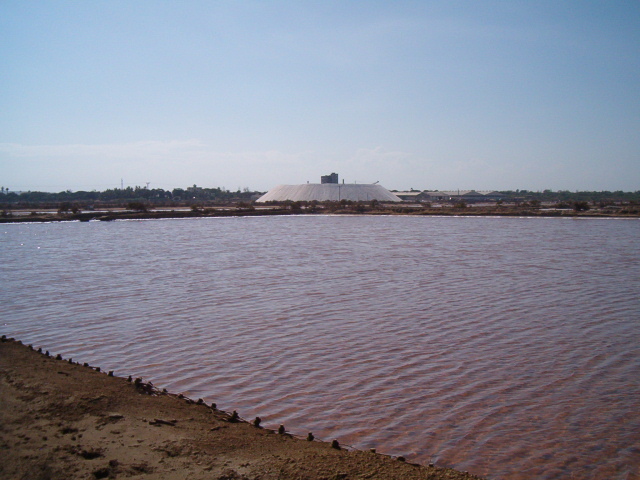 In Kenya, thousands of acres of mangrove forests have been cut down to construct huge salt works or to make way for other development projects. Coral reefs support thousands of species in what many describe as the “rainforests of the seas.” Reefs are home to one quarter of the ocean’s biodiversity even though they cover only a tiny percentage of the ocean floor. 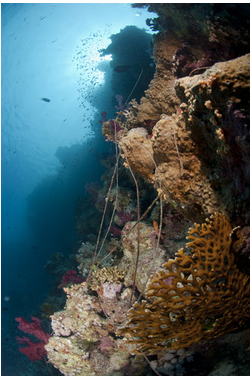 Nealy 1500 species of reef-building coral alone make up their infrastructure. In a sense, coral reefs represent a microcosm of the ocean at large. Like the ocean, reefs have immense economic value for local communities who depend directly on them for eco-tourism and indirectly for the fish that swim on or around reefs. Perhaps the greatest and most unsung value of the reefs are the medicinal benefits that we are just beginning to explore and understand. 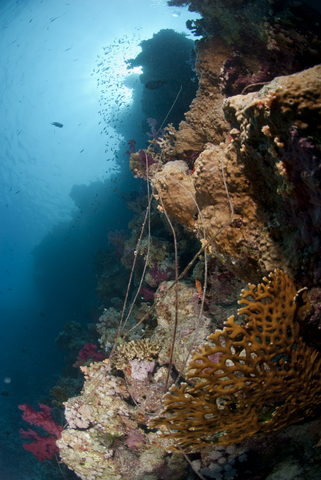 Like rainforests, reefs have an array of unknown compounds with promising medical applications. Coral reefs have been under significant threat. Stresses, with results that can range from negligible to catastrophic, are both natural and human-induced. Human-induced threats come in the form of agricultural and industrial runoff, increased sedimentation from land clearing, and human sewage and toxic discharges. 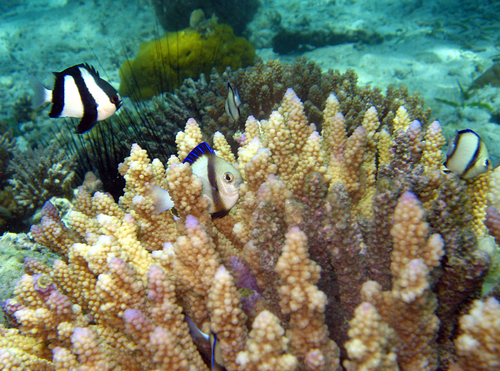 Many land-based activities have important implications for reefs. Agricultural activities, for instance, can introduce herbicides, pesticides, fertilizers, and runoff from animal feed lots. Sewage discharges can introduce nitrogen and phosphate compounds, along with pathogens and mixtures of toxins. Uncontrolled land clearing often leads to erosion, resulting in an increase in sediment loads to surface waters. Roadways, parking lots, and buildings consist of impervious surfaces that increase runoff rates, and that runoff carries mixtures of dissolved substances into surface waters. The surface waters in any watershed eventually discharge into coastal or near-coastal waters. These waters can then negatively affect coral communities associated with the discharge points. Thus, activities occurring in distant locations impact reefs which are far away from these activities. Eco-tourism is recognized as an important source of revenue for local economies; yet, threats to coral reefs, a major attraction, go unchecked. Although reefs display a surprising adaptation to short-term natural catastrophic events, they are not well adapted to survive exposure to long-term stress. Most people are aware of the destruction of rainforests and other above-ground habitats, but we do not always think about the devastation under the sea. Though they cover only a small percentage of the ocean floors, tropical coral reefs have an estimated yearly economic value of about US$30 billion annually in global goods and services. Artisanal fishers use destructive beach seines that damage the sea grass as the nets are dragged along the ocean floor. In recent years, a new fishing technique using ring nets (simpler versions of purse seine nets) has increased in popularity, causing even more harm to coral reefs and sea-grass beds. Ring nets (typically used in inshore areas) often drag over corals or sea-grass beds, damaging these habitats. The exotic tropical fish that swim on reefs are in high demand as pets, as well. Poachers use either dynamite or cyanide to stun the fish, causing damage to the reefs without regard for other organisms that make their home there.The seriousness of such human activity is demonstrated by the fact that destructive fishing methods have resulted in threats to endangered and threatened marine species such as dugongs and sea turtles. The dugong occurred in large numbers off Kenya before the 1960s. This species declined significantly due to incidental catches in gill nets. Currently, dugongs still exist, but in small numbers, especially off the Tana delta area, in the Lamu archipelago, and in Kiunga and several locations in Tanzania, especially the southern region around the Rufiji River Delta. Red List of Threatened species. CORAL BLEACHING: Reef-building corals contain plant-like organisms called zooxanthellae that live symbiotically within their tissues. Zooxanthellae provide their coral host with food and oxygen, and, in return, the zooxanthellae receive nutrients and carbon dioxide. When ocean temperatures increase even a degree or two warmer than usual, this critical symbiotic relationship breaks down and the zooxanthellae are expelled, leading to a bleached appearance, and often the coral’s death. Global warming has caused coral bleaching in much of the western Pacific and Indian Oceans, leading to mass coral mortality in many countries. OCEAN ACIDIFICATION: Long-term global climate change is causing the world’s oceans to become more acidic. A quarter of the carbon dioxide produced by the burning of fossil fuels enters the ocean and reacts with water to form carbonic acid, acidifying the ocean, which makes it more difficult for corals to secrete their calcium carbonate skeleton. ﻿﻿For generations, the East African coast has enjoyed an enormous amount of rich maritime resources and plenty of fish. The local people relied on these resources to sustain their livelihood and cultural traditions up until the 1980s, when Chinese and Korean ships started fishing illegally in East African waters. A confluence of events in the 1990s, around the time the EU tightened fishing controls in Europe, pushed some fishing ships to look for new waters. Fleets from Europe and Asia, many operating illegally, moved into the open East African waters to fish, plundering, according to m﻿any reports, the oceans of fish stocks, which caused decimation of the livelihoods of many local fishermen in East Africa. Moreover, for many years now, East African countries have experienced explosive population growth rates--some of the highest in the world--despite widespread droughts, famines, and pervasive diseases (malaria, tuberculosis, typhoid, cholera) that daily claim many lives. Kenya, for instance, has seen annual population growth rates of 3% to 5% for many years, with the result that its population has doubled every 20 years or so. Obviously, more people means a greater demand on the resources. Such intensive resource use poses serious threats to coastal/marine ecosystems. The threat to whale sharks has increased over the years, resulting in a dramatic decline in the population of whale sharks (known locally as papa shillingi) off the coast of Kenya. Most have been victims of incidental or by-catch during drift-net "jarife" fishing. Overfishing has led t﻿o shortages in the near-shore fish supply, forcing fisherman to go farther out into the ocean to find fish, an insurmountable undertaking for many local fishermen who often have small vessels. In fact, most near-shore fisheries are on the brink of collapse, which, in turn, has led to an overall shortage of fish and high unemployment, negatively impacting coastal economie﻿s. Discharge of Untreated Domestic and Industrial Waste. Pollution in East Africa is extensive, caused by such factors as the unregulated discharge of industrial waste, untreated sewage, pesticide-laced runoff from farms, herbicides and fertilizers, and the unfettered disposal of plastic waste. Direct discharge of domestic sewage from many point sources into mangrove forests or the open sea water is not uncommon. Many industries along the coast, as well as upcountry industries, whose effluent is carried by rivers into the ocean, do not treat their effluents, and, as a result, heavy metals and other toxic chemicals are discharged into the marine environment through run-off, hence increasing the Biological Oxygen Demand (BOD), leading to eutrophication in some areas. 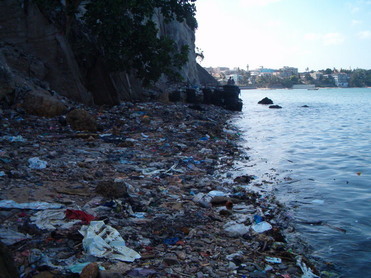 Garbage lines the streets and saturates lakes and rivers. Much of this waste ultimately ends up in the ocean. 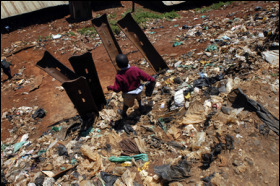 East African cities lack adequate waste handling and disposal facilities; therefore, all of this waste has become a serious environmental threat. Plastic bags and other trash end up in our world’s oceans every year. These and other single-use disposable items find their way into the water when they fall out of trash cans or are dropped on the ground by litterbugs. When it rains, these items are washed into local streams that feed into the water. It does not matter where the trash originates, because it all ends up in the ocean. Large plastic items entangle and suffocate animals. In addition, some plastics such as water bottles may be mistaken for prey by some animals, which may end up ingesting them and suffering serious harm. Some turtles, for instance, mistake plastics for jellyfish, or sea birds mistake plastics for sardines. But the problems do not end there. Plastic and other petroleum products do not ever completely break down, but they do photo-degrade when they are exposed to the sun’s rays for a prolonged period of time. Photo-degradation results in many tiny pieces of plastic (so-called microplastics) floating around the ocean gyres, or currents, thousands of miles from shore. Microplastics cause great concern because they are ingested by many marine organisms. The effects of these microplastics is potentially devastating, and not yet fully understood. While it may be easy to put these out-of-sight problems out of our minds, we will not be able to do so for much longer. In particular, discarded plastic beverage bottles are ubiquitous, choking entire water bodies. Attesting to this phenomenon, a 2009 United Nations report on ocean pollution noted that plastic bottles accounted for more than 80% of the total garbage collected from major oceans. Serious environmental and health threats are posed by waste imported from industrialized nations. 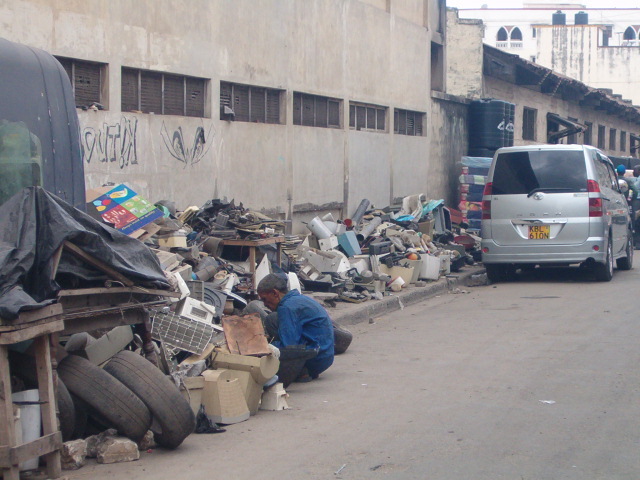 East Africa receives hundreds of container-loads of e-waste each month from developed countries. In fact, with the increase in consumption of electronic products, the amount of electronic waste discarded globally has skyrocketed to 20-50 million tons annually. These items, disguised as “donations,” can be found in piles throughout the countryside, clogging dump sites and saturating lakes, rivers, and swamps. In addition to imported e-waste, there has been an increase in consumer electronics use by East Africans themselves. For example, in the last decade mobile phone use in East Africa has proliferated to over 50 million phones. Dump sites are literally overflowing with electronic waste, including mobile phones, obsolete television sets, computers, and batteries--all containing harmful substances. 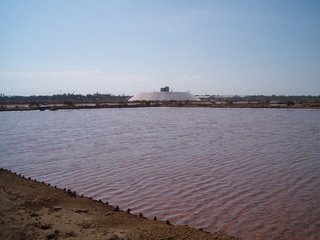 Toxins produced by this waste leach through the soil to the water tables below, and poisonous runoff forms rivulets that flow ultimately into the ocean. At the same time, the local people (particularly children) traverse these dump sites on a daily basis, putting their lives at risk of contracting cancer, respiratory ailments, and skin diseases due to lead, cadmium, and mercury, all poisonous by-products of the electronic waste. Pollution enters waterways in many ways, shapes, and forms, such as huge oil spills that wreak havoc on marine habitats. Road runoff, illegal dumping, and cruise ships are major sources of the 700 million gallons of oil that annually flow into the oceans. In short, the cumulative environmental impact of exponential population increase, over-exploitation of natural resources, and destructive practices in resource use have physically altered and degraded entire habitats, leading to losses in biodiversity and, indeed, the extinction of entire species. Equally pervasive and more disturbing, widespread pollution poses a toxic threat to coastal/marine habitats and, more generally, to the East African people. The environmental damage being caused is just too severe, the losses too great, the causes of degradation too monumental, and the task to repair the damage too daunting to expect East Africa to deal with alone. If environmental degradation continues unchecked, the impact on East Africans will only worsen. Clearly, there is an urgent need to bring about environmental awareness in East Africa and globally, in a collaborative effort to preserve East Africa’s coastal/marine environments. Further, there is a need to educate regional and global populations about East Africa’s failing coastal and marine habitats, as the failure of these ecosystems has broad implications.